Note from LeftEast editors: We re-publish this text from The Brooklyn Rail. The English version was translated from the French by Janet Koenig. This text was published in French in the journal CQFD Mensuel de critique et d’expérimentation sociales 136 (October 2015). We met with Salma, Hani, Majd, Oussama, Abou Selma, activists infused with the values of anti-authoritarianism and direct democracy. Formerly from Damascus and the surrounding areas, notably Douma (the city of sad renown) and Yarmouk Camp, they are now living in Toulouse, Paris, and Beirut, where they have come to “catch their breath” and prepare for the next round of struggles. For them, the conflict’s outcome will not be a choice between “Bashar or Sharia,” as the chorus sings, from the extreme left to the extreme right. The despot’s current rehabilitation, one that throws the Syrian opposition into the same bag as Salafist obscurantists, feels like a knife in the back to these activists. Crushed for the time being, they don’t give up. This would be self-betrayal. By publishing their testimonials, CQFD wants to help give these invisible combatants back their voice. 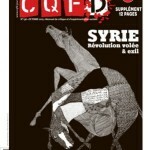 “They stole the Revolution from us!” exclaims Majd, an early actor in the Syrian Spring, now a recent refugee in France. Since the popular uprising in March, 2011, networks of resistance have formed in the continuum between militants in exile and those working in Syria’s liberated zones. Ignored by the media that favor endless geopolitical analyses, these networks have had to endure ferocious repression and to cope with the rapid militarization of the uprising, caught between the development of Islamist and jihadist movements backed by Western and regional powers. Finally, they see themselves betrayed by an official opposition of stay-at-home, corrupt, and disembodied notables in exile. Despite all this, these networks try to hold on to the revolutionary spirit they had at the beginning. Even when they find themselves driven back to struggling for survival in the beseiged zones, not surrendering is their last hope of one day seeing the tyranny fall. Hani, Salma, and Majd are part of one the largest networks still active around Damascus, a network attached to the local coordinating committee and organized around the personality of Rasan Zeitouneh. This young Damascus lawyer, along with her husband Wael Hamada and two of her colleagues (including the wife of the writer Yassin al-Haj Saleh) were kidnapped. Everything suggests that a local warlord, whom the regime’s forces had liberated from jail, committed the abduction.1 Rasan Zeitouneh had contributed to the Violations Documentation Center which works on documenting the regime’s crimes and which demands that all political prisoners be freed. At Douma, she started a women’s protection center where more than 300 women regularly distribute survival baskets: for Douma’s residents, survival has become a means of resistance. These activist networks in Douma, as in other zones in Syria, depend more or less upon the local councils, through which the resistance attempted to structure itself across the country. In October 2011, Oma Aziz, an anarchist militant who died in prison in February, 2013, founded the local committee of Berzeh (a municipality north of Damascus). He called upon Syrians to organize themselves into self-governing bodies, independent of the state, by means of horizontal and collaborative practices. 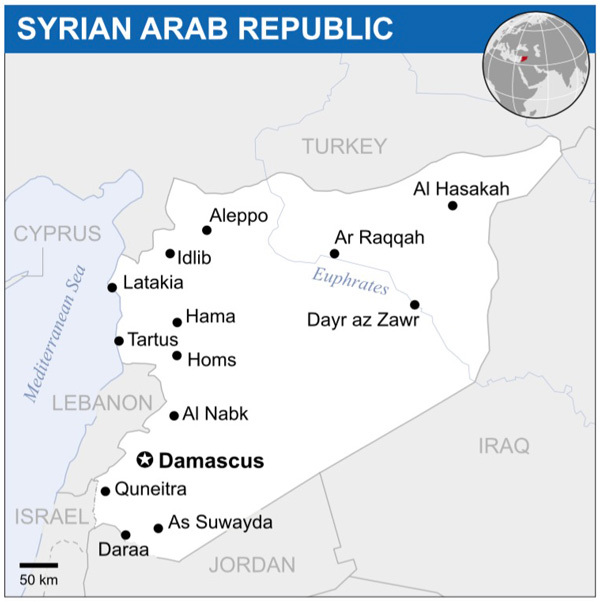 Today, every province has a council except Damascus, the heart of the state’s security system. For the network activists, the militarization of the conflict and the rise of certain rebel groups must not erase the fact that the principal enemy is Bashar: “With the front necessarily united under ‘Anything but Bashar,’ it’s not possible to define a perfect political alternative for Syria. What we have for the moment is the revolution against tyranny above all.” This absence of a political plan, combined with the difficult circumstances of cohabitation by necessity with groups of armed Islamist groups in the free zones, makes it very hard for Arab and Western leftists to identify networks like Razan as allies to support. The old anti-imperialist stance then becomes a pretext for the left to adopt the worst of positions: support for the Baathist regime, following the example of the most reactionary political tendencies. For Salma, Hani, Majd and Abou Selma, the argument about the opposition’s Islamization harmed the popular civil movement that began in 2011. It is less a description of the reality of the social movement than discourse delivered to the outside world, which has served the regime, now posing as a protector of minorities. For Salma, “The sectarian argument is used as an excuse for all the parties in the conflict, from Bashar to the foreign powers. It’s as if there were a plan in two stages, the first to make everyone believe that the sectarian groups are irreconcilable, the next to impose a partition, a carving up into zones of influence as in Libya or Iraq.” Marwan insists on the likelihood of a devastating intervention by the regional powers, supported by their international allies: “Syria is not in the hands of Syrians. Even with oppositional institutions, we haven’t succeeded in committing to democracy. The material damage will one day be replaced by Iran or Saudi Arabia. 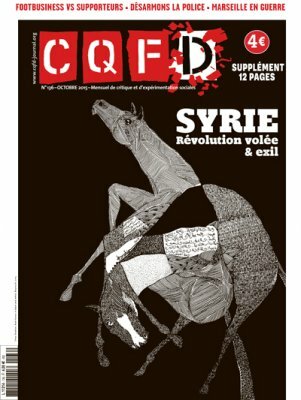 For me, that’s where the revolution is lost.” When in September French Defense Minister Le Drian announced France’s first military strikes against Daesh, when Russia’s soldiers landed in northern Syria and China stationed an aircraft carrier at the Syrian port of Tatrous, it is clear that no power has volunteered to support the civil uprising or really wants the Assad regime to fall.